By 1994, I had the person willing to teach us medieval building techniques, Fritz Gruber from Austria, and I had the quasi-experienced builder from Italy, a Dane named Lars Nimskov, who understood what I wanted to do and was willing to stay the duration. Gruber also sold ancient, handmade European bricks. Further, I had spent years, even before I knew I was actually going to build something, researching where to get raw materials. I searched in South America, Israel, and in much of America and Mexico and throughout Europe. Over a duration of many years, I had acquired a wide source-list of addresses for the materials I needed to build my castle. In the 1980’s and 90’s, I was going to Italy for as long as three months at a time. In fact, in 1989, I moved to Rome for six and a half months. While there I made a promise to myself, a promise I had considered for years, to purchase an Italian property before departing to Rome. With little time left, I made a frantic search over the remaining weeks. I decided I didn’t want a property in Lazio, the region of Rome, instead deciding on Umbria or Tuscany, which I found to be infinitely more beautiful. I went with several realtors day after day, from morning to night, looking at properties. Finally I found it, a small 12th century castle, Castello di Panzalla, just 12 miles outside of Florence in the hills of Chianti Classico and that had once belonged to the cousin of the King of Italy. I bought it, along with 220 acres and four farmhouses that came with the property. I negotiated the entire transaction in Italian with out a lawyer, relying on the German realtor living in Chianti. I was full of exhilarating ideas to restore the castle to its former glory. But, a short time after I returned to the U.S., the castle was severely vandalized and burglarized. 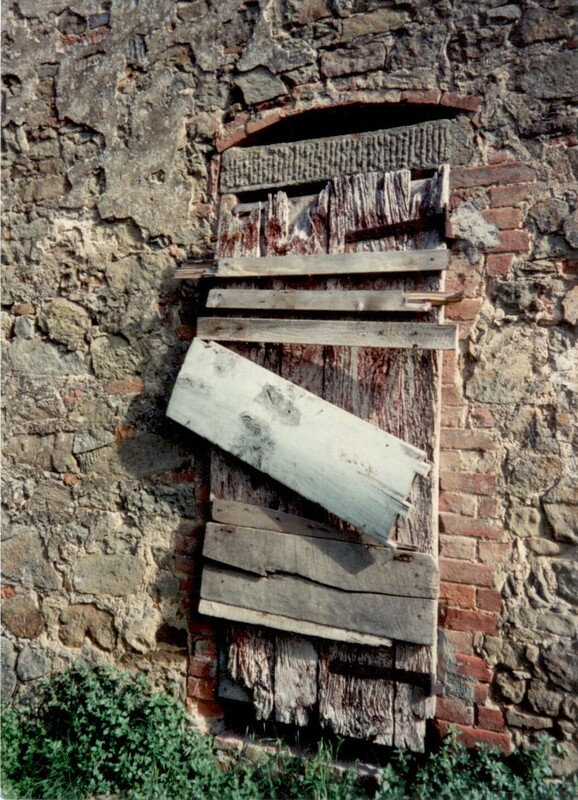 Ancient, dated plaques were ripped out of walls, old roof tiles and all the 300 year old interior doors stolen, virtually every window smashed, ancient coat of arms torn from walls, the entrance door destroyed, hand-chiseled pavement stones dug up. Anything of value and portable was hauled away. I was devastated. My dream had been destroyed; and I didn’t want Castello di Panzalla any longer. I put it up for sale. I thought selling the property would take ten years. There are not a lot of buyers for castles. The following year, 1990, I went looking for more property with the German real estate agent, whom I wholeheartedly trusted, never believing him to be absolutely disreputable as I was later to discover. For three weeks, night and day, I searched. One day I came upon a 10th century, fortified, Augustinian monastery dominating the hillside in the countryside just 23 miles east of Siena on the road to Perugia. I knew within a half an hour that I would buy it. The only question was the price. It was totally run down, with mounds of garbage everywhere. My wife hated it, but I could envision what it had been and what it could be; and I loved it. Out of what was to become my bedroom window, I had the most perfect view in the world — golden fields, stone farm houses, lush vineyards, rolling hills, two castles and another monastery. I was in heaven. After buying my monastery and naming it Monastero di Coriano, my dog Pipo and I set about restoring it. I could have written “Under the Tuscan Sun,” myself, but with some different twists. 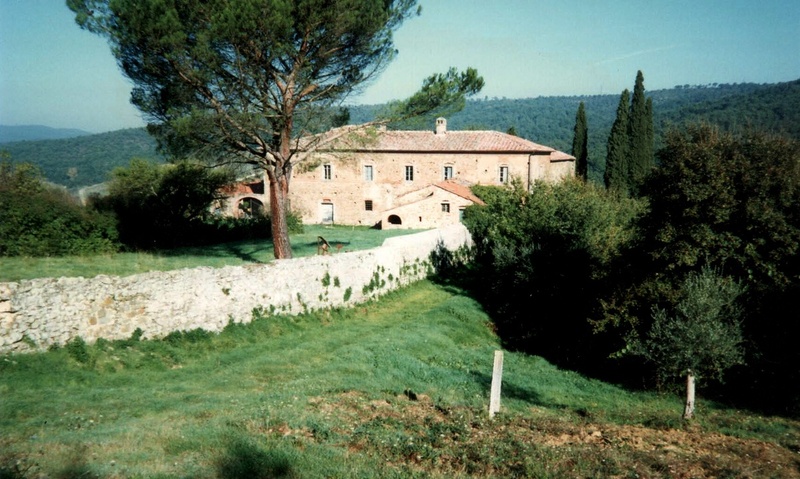 It was by using Monastero di Coriano as a home base that I began diligently researching medieval buildings. I would get on my motorcycle or in my car before dawn, day after day, with a backpack containing a hammer, a tape measure, camera and film and sketchpad and pencils. I would return home after dark having seen and thoroughly inspected, studied, measured, sketched and photographed every detail of what I had discovered. The hammer was used in case I had to break in. It must be remembered that twenty years ago there were a lot of abandoned farm houses, palaces, churches and castle in the countryside of Umbria and Tuscany. The rural population had left en masse in the late 60’s and 70’s to escape the tedious and uncomfortable agricultural life without amenities to live in modern rented cement boxes called apartamenti in the cities, where they’d have wall-to-wall carpeting, running water, and central heating. Here they found work in factories such as Fiat or Olivetti. 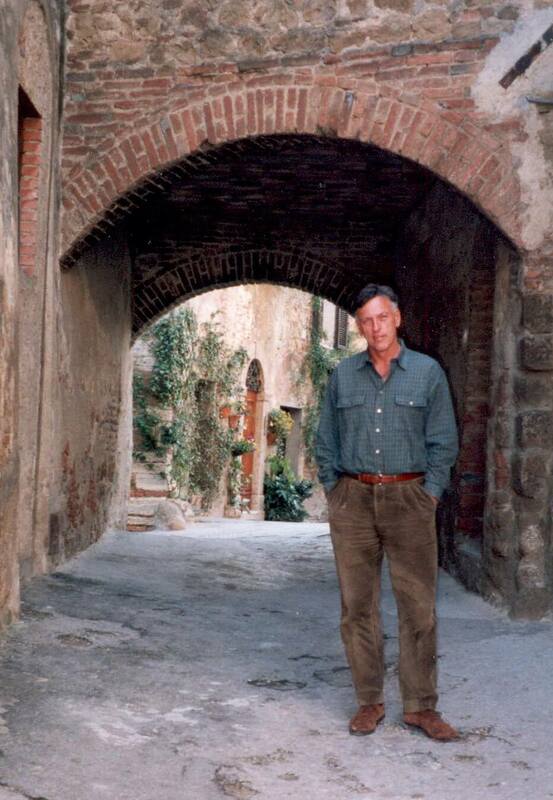 Dario Sattui in the entrance to the Monastery in 1995. As a result, there was a plethora of medieval buildings, great and small in the countryside waiting to decay or be restored. The Italians seemed to want no part of restoring them; they were happy to part with them for a song. It was mostly the English, the Germans and the Swiss who discovered these treasures and began buying them up cheaply to restore. In short, it was foreigners who saved the countryside of central Italy. When I couldn’t walk or pry open a door or window, my insatiable thirst for knowledge about these buildings forced me to be clever. I would dress up in a suit and tie and go to prominent realtors pretending to be a wealthy person wanting to buy a castle on the market. I was even given ancient building plans, but of course, I bought none of these properties. I only wanted to study these masterpieces, and I had no idea why. Something inside me compelled me to do it. Without realizing it, I was slowly acquiring the knowledge that would enable me to build my own castle….